Orlando Bloom attended Jennifer Meyer’s 40th birthday party at Peppermint Night Club in West Hollywood. He was wearing a Maison Margiela varsity jacket and Air Jordan retro 4 premium “Ginger” sneakers ($400). Migos member Quavo performed in London, England wearing a gold Fear Of God bomber jacket. 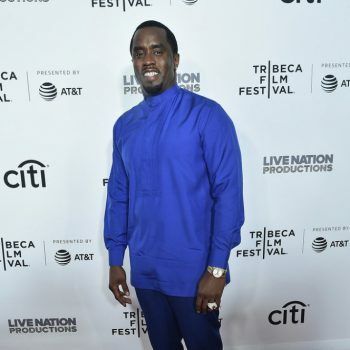 Sean Combs, was in attendance at the 2017 Tribeca Film Festival for the ‘Can’t Stop, Won’t Stop’ documentary. He wore a purple design from the Salvatore Ferragamo’s Spring 2017 collection. John Legend wore head-to-toe Gucci​ to the 2017 Time 100 Gala on Tuesday (April 25) in New York City. Ryan Reynolds attended the Time 100 Gala wearing a Brunello Cucinelli navy tuxedo.